How to Find Anova Add-ins In excel? 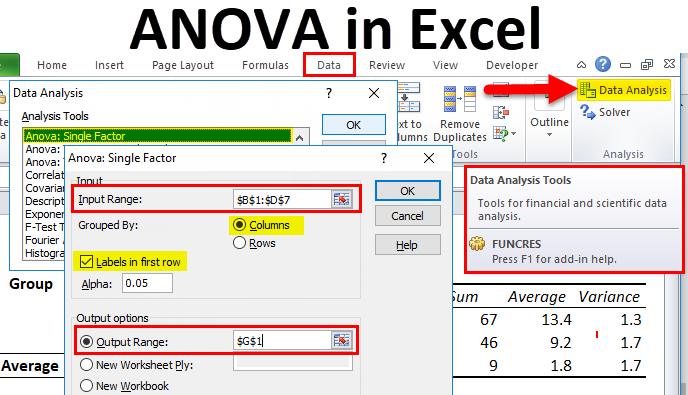 How to Use ANOVA in Excel? 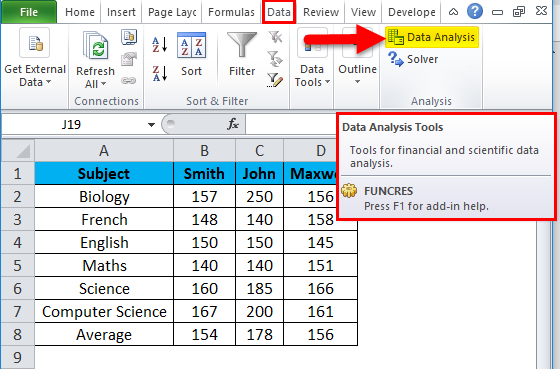 In Microsoft excel we can use several add-ins and a built-in tool to finish the work in the easiest manner. 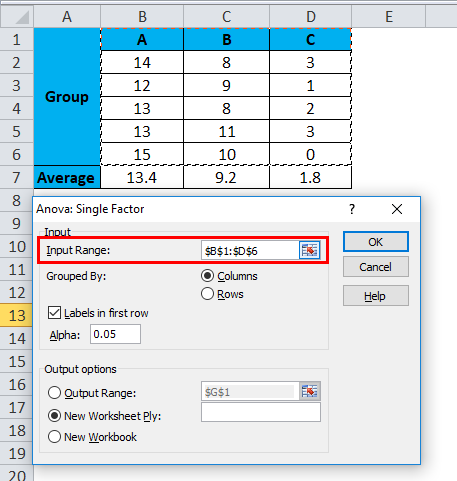 Excel Anova is one the default built-in tool add-ins which is used to determine whether there is a significant difference between the means of two groups. Anova – stands for Analysis of Variance. Anova in excel is a statistical method which is used to test the difference between two or more means. Why ANOVA is used in excel? 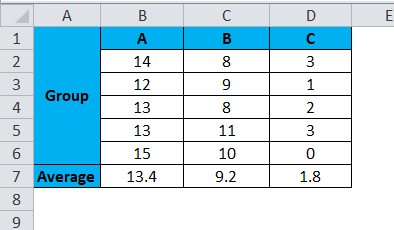 In Microsoft excel ANOVA- one-way analysis of variance is used to determine the factors of those mean are statistically significant or not, where mean square denotes the variation between the sample means i.e. it simply test the null hypothesis. In excel we can add the add-ins either by downloading from the internet or by purchasing the specific add-ins. Nowadays we can find a huge number of add-ins on the internet which are available for download. In excel, add-ins are always groped under DATA menu by default, Excel does not have add-ins and the data menu will appear. 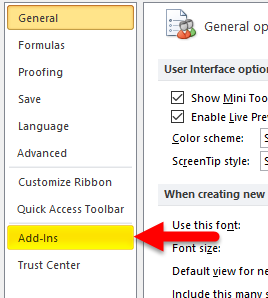 In order to add add-ins in the excel follow the below steps. In Excel go to Go to File menu. 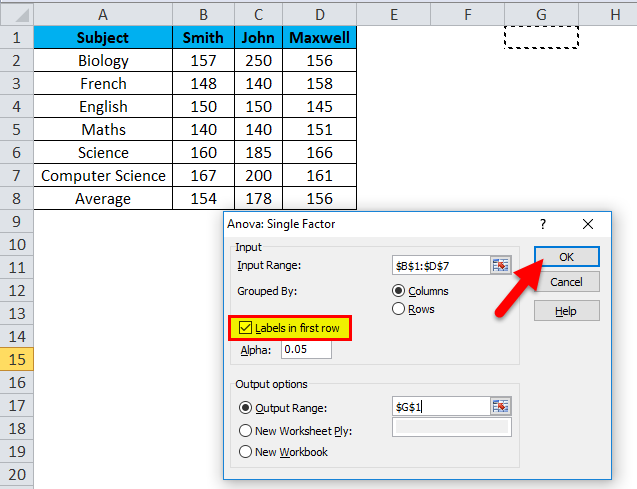 Choose Option where in the older version we can find the option called as “EXCEL OPTION”. 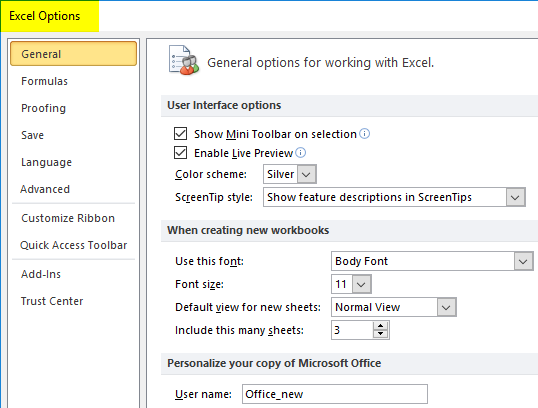 So that we will get the Excel options dialogue box window as shown below. Now we can see add-ins, Click on the add-ins. Once we click on the add-ins we will get the window as shown below where it shows a list of add-ins, The first part shows the active Add-ins are installed which are being used in excel and the second part shows that Inactive Add-ins that are no longer available in Excel. At the bottom of the window, we can see the manage option where we can manage add-ins over here. In excel in the Manage option, we have add-ins option like Excel add-ins, COM add-ins, Action, XML expansion packs, Disabled Items. Click on the active add-in to add it in the excel. 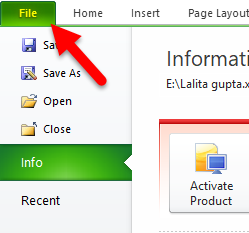 First, we will see how to activate Excel add-in in excel which is shown in the first part. 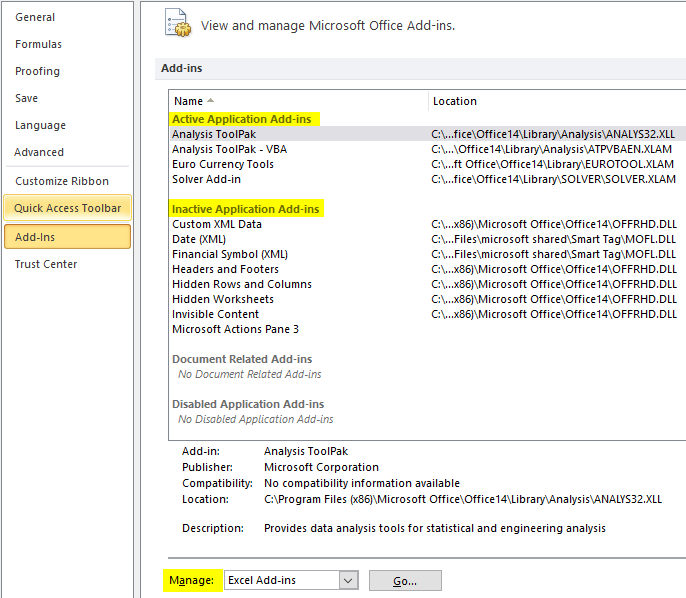 Select the first add-ins Analysis ToolPack. And at the bottom, we can see the manager drop down box in that select Excel-add-ins and then Click on Go option. We will get the Add-Ins window as shown below. 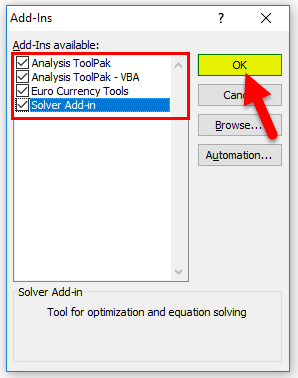 Now the analysis tool pack contains a set of Add-ins which will show us the option to choose it. 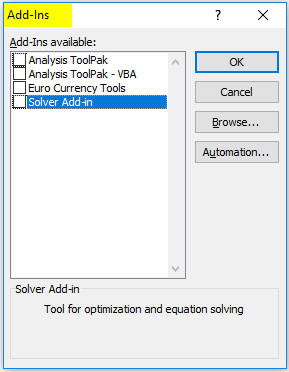 We can see that Analysis Tool Pack, Analysis Tool Pak-VBA, Euro Currency Tools, Solver Add-in. Check marks all add-ins and give OK, so that selected add-ins will be get displayed in the data menu. After adding add-ins we will have to check whether it’s been added in data menu or not. Go to the Data Menu and at the right-hand side, we can see that add-ins are added which is shown below. Now we can see in the data tab Data Analysis has been added under the analysis group which is highlighted in Red color. 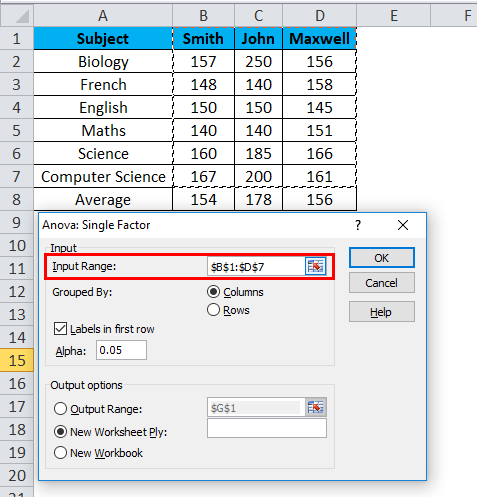 ANOVA in excel is very simple and easy to use. 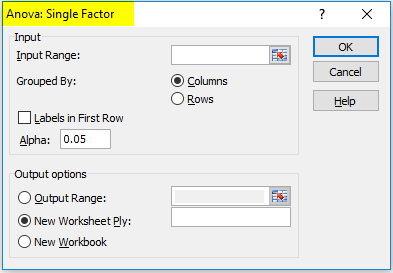 Let’s see the working of excel ANOVA single factor built in tool with some different Examples. 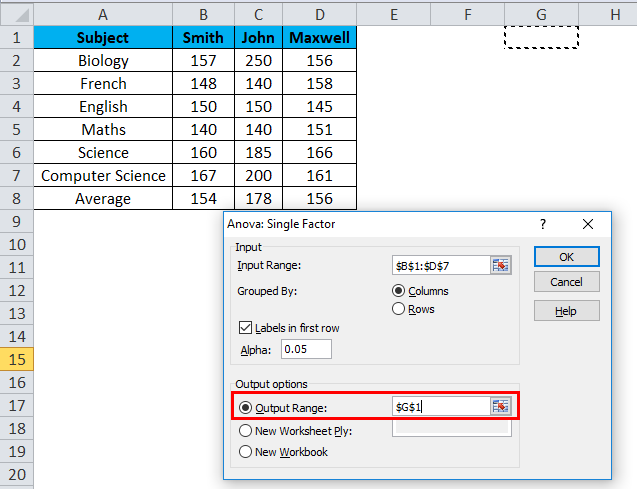 In this example, we are going to see how to apply Excel ANOVA single factor by following the below example. Consider the below example which shows students marks scored on each subject. Now we are going to check that student’s marks are significantly different by using the ANOVA tool by following the below steps. First Go to the DATA menu and then click on the DATA ANALYSIS. We will get the analysis dialogue box. In the below screenshot, we can see the list of analysis tool where we can see the ANOVA- Single factor tool. Click on the ANOVA: Single factor tool and then click OK. So that we will get the ANOVA: Single factor dialogue box as shown in the below screenshot. Now we can see the input range in the dialogue box. Click on the input range box to select the range $B$1:$D$7 as shown below. 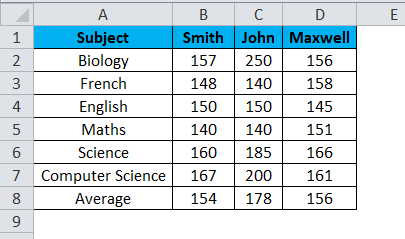 As we can see in the above screenshot we have selected ranges along with the student name to get the exact output. Now the input range has been selected, make sure that Column Checkbox is selected. Next step we want to select the output range where our output needs to be displayed. 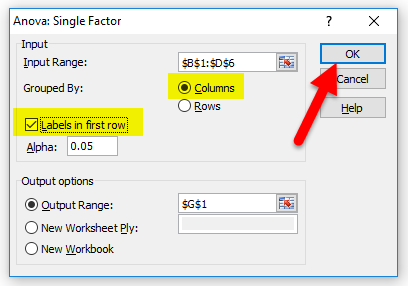 Click on the output range box and select the output cell in the worksheet which is shown below. 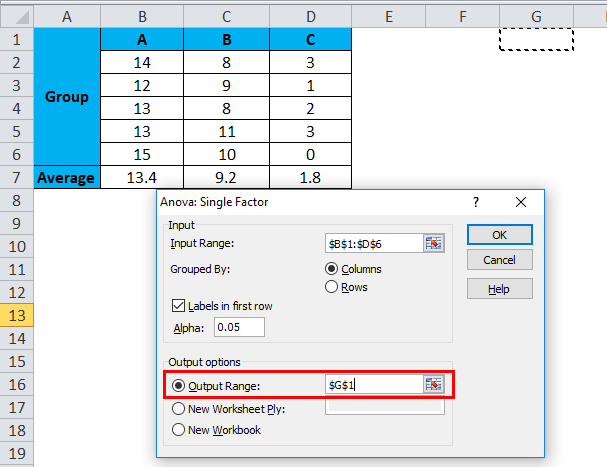 We have selected the output range cell as G1 where the output is going to be displayed. 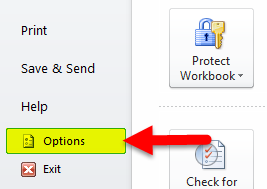 Make sure that Labels in first row Checkbox is selected and then click on OK. 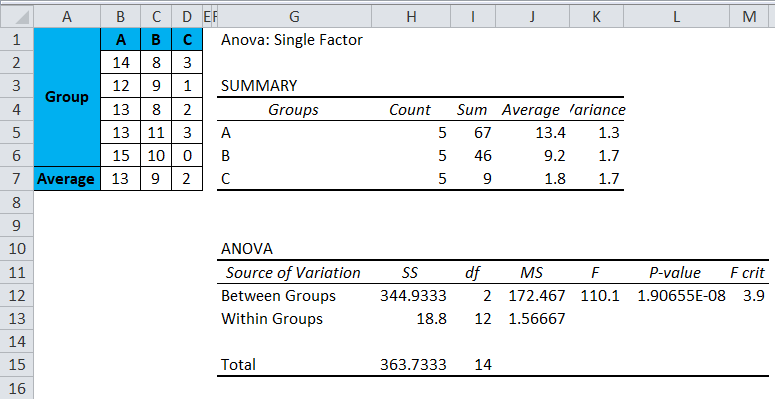 The above screenshot shows the summary part and Anova where summary part contains the Group Name, No of Count, Sum, Average and Variance and the Anova shows a list of summary where we need to check the F value and F Crit value. F Statistic: The F statistic is nothing but values we get when we execute the ANOVA which is used to find out the means between two populations significantly. F values are always used along with the “P” value to check the results are significant and it is enough to reject the null hypothesis. If we get the F value greater than F crit value then we can reject the null hypothesis which means that something is significant but in the above screenshot we cannot reject the null hypothesis because F value is smaller than F critic and the student marks scored are not significant which is highlighted and shown in the below screenshot. If we are running an excel ANOVA single factor make sure that variance 1 is smaller than variance 2. In the above screenshot, we can see that the first variance (92.266) is smaller than variance2 (1877.5). In this example, we will see how to reject the null hypothesis by following the below steps. In the above screenshot, we can see the three groups A, B, C and we are going to determine how these groups are significantly different by running the ANOVA test. First, click on the DATA menu. Click on the data analysis tab. 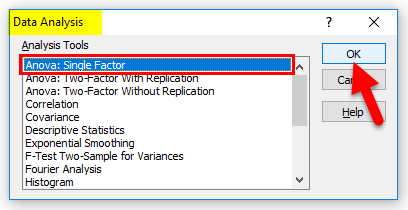 Choose Anova Single factor from Analysis dialogue box. Now select the input range as shown below. Next, select the output range as G1 to get the output. 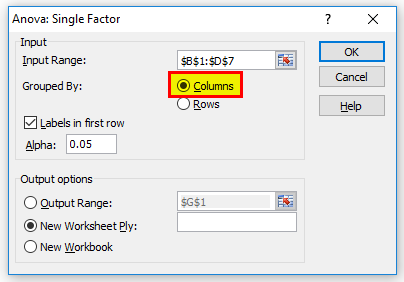 Make sure that Columns and Labels in first row Checkbox are selected and then click on Ok.
We will get the below result as shown below. In the below screenshot, we can see that F value is greater than F crit value so that we can reject the null hypothesis and we can say that at least one of the groups is significantly different. Excel ANOVA tool will work exactly if we have correct input or else it will end up with wrong data. Always make sure that the first variance value is smaller than the second variance so that we will get the exact F Value.